Goddard Design Co. - DMX512 Equipment - Theatrical Control Equip. Goddard Design Co. products address technical needs in theater, film/TV, worship and architectural lighting, and event production. 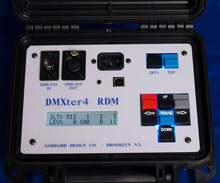 The DMXter4A RDM and the MiniDMXter4 are the world’s standard for test and verification of the DMX512 (ANSI E1.1) and RDM (ANSI E1.20) control protocols used in lighting. Our line of DMX512/RDM splitters and hubs provides for the efficient and cost-effective distribution of these protocols, whether in a permanent installation or a one-night event. These DMX-Net/RDM distribution modules combine lower installation cost with increased user flexibility. Our AWU4A scenery mechanization controllers provide reliable and cost-effective control of deck and flying scenery movement on Broadway, regional theater and events. The Chaos Audio intercom system has its roots in rock-n-roll, which underscores its rugged reliability and unequaled communication clarity in high ambient noise environments and quiet theater use alike. V4.37 adds Dynamic RDM User Interface More here. DMX-Net RDM - distribution scheme with active RDM wall plates. Now with lower current requirements, simplifying layout and lowering costs. A distributed RDM Hub designed for wall boxes, wireways, plug strips and trusses. A truly flexible way to distribute DMX/RDM. Now with lower current requirements, simplifying layout and lowering installation costs. Major TV studios use The BACKFADE for console backup. Available in the USA from Goddard Design Co.
Portable battery powered center line or entrance markers for the stage.